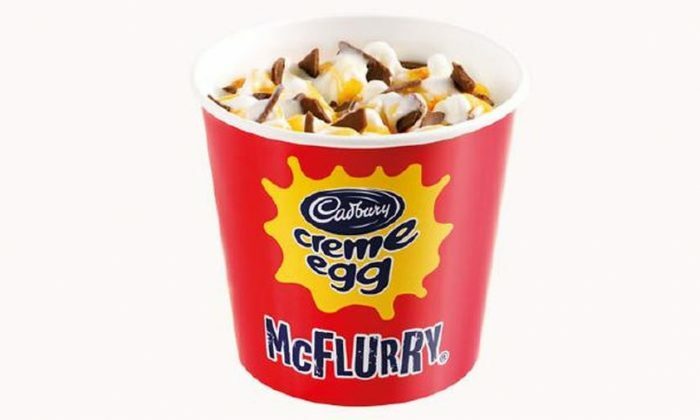 McDonald’s has released a new Cadbury Creme Egg-flavored McFlurry in Australia. The product is a combination of the McFlurry and the Easter candy. McDonald’s says it is “a delicious mouthful of chocolate pieces and Crème Egg topping, blended into a creamy soft serve,” and sells for $4.80. According to its website, the drink has 54.4 grams of sugar, which is about two times the recommended daily amount of sugar one should consume (recommended by the World Health Organization). Per serving, it contains about 383 calories, 7.4 grams of protein, 12.2 grams of fat, and 7.8 grams of saturated fat. News Ltd. reported that the Cadbury Eggs are smashed up and blended into the drink. The item will only be available for a limited time. “This creme egg McFlurry thing had better not be fake, I couldn’t take it. My mouth is watering just at the thought of it,” one woman wrote on Twitter, per MailOnline. “I guess I’d better say hi to those fat cells again,” said another. Dear $MCD, were the fattest country. Why don’t we have this?